I have previously provided a limited history of Johann Georg Wanner and Anna Schmid. As I wrote that history and compiled some other histories, I kept finding a couple of references to a history written by Edna Wagstaff Owen. I started trying to contact a member of that family and to see if they had a copy of that history. Fortunately after some time, a copy of that history was provided. I now provide it in full with minimal edits. I was asked a few day ago to represent Mary Wanner Wagstaff’s family at the 1978 Wanner – Schmid reunion, to do something on the program. I haven’t had much time to get ready for it and really didn’t know what I could do. After much thought and meditation, I decided it would be nice to honor Grandpa and Grandma Wanner by telling you a few things I can remember about them. On 6 June 1870, a little 24 year old man from Holzgerlingen, Germany, John George Wanner and a beautiful 21 year old girl, with beautiful auburn hair named Anna Maria Schmid from Holzgerlingen, Germany were married and started a life for themselves together. 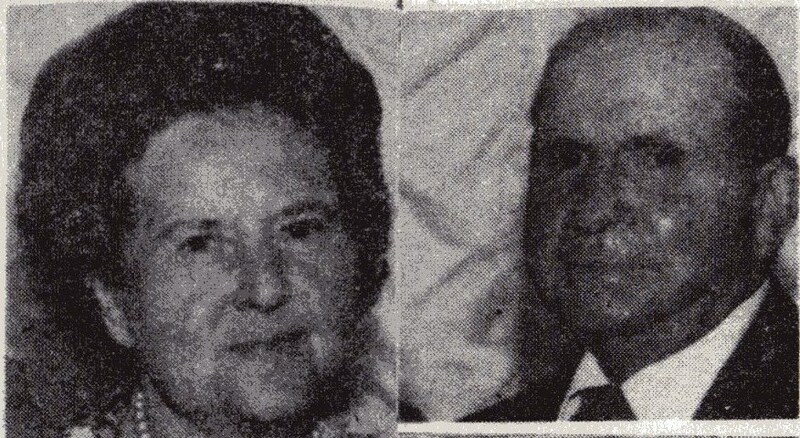 This lovely couple, we love to call our grandparents, became the proud parents of 10 children – 5 boys and 5 girls, all of whom lived long good lives, except 2 sons, who died in Germany and dear Aunt Pauline, who passed on at the age of 37. Their youngest daughter Wilhelmina is here with us today and we are honoring her. She is 90 years young. They have had 73 grandchildren born to them and now their posterity runs into the hundreds. They dearly loved these children and tried untiringly to bring them up and taught them by example as well as precept. Some of the great qualities they left us always to love the Lord and our fellowman. To be honest always and how to work. I don’t know of one of their children, grandchildren or great grandchildren, who haven’t tried very hard to do this. Grandpa and Grandma never lost sight of what they left Germany for – which was the Gospel and to live in America where they were free and could worship as they choose. It was in May 1891 while Grandpa was working on the highway, two missionaries came along and told him about the Gospel and the Lord’s work. In October 1891, they and their three eldest daughters were baptized. George was the first to be baptized in July 1891 and came over to America with one of the missionaries, Brother Terrell from Providence, Utah. Louise, Frederich and Pauline were baptized in June 1894. Gottlob in June 1894 and Wilhelmina in August 1896. Grandma took the missionaries in and accommodated them with beds, food, etc. and helped them with the German language. Over in Germany, it was the custom for women to do the farm work, cutting of the hay with a scythe and putting it up by hand. When the children needed shoes or dresses, the shoemaker and the dressmaker would come to the home to do these services. In writing this little history and remembrances about Grandpa and Grandma Wanner, I thought it would be proper, nice, and informative to tell just a little about the country they lived in before coming to America. Germany had been a great country and has produced many great and talented people. It has become known as the land of poets and thinkers. Germany as a nation state did not exist until the German Reich of 1871. The Roman Empire was in control for five centuries. It is a diversified country – wooded areas account for 29 percent of the land, providing beautiful forests with hiking trails. The people of Germany love nature and most of the homes have plants and flowers in them. Germany has become known for its beautiful castles and for being a progressive country. Germany has been described by some of our relatives and friends who, have visited it, as a very beautiful country of mountains, streams, rivers and beautiful forests. Grandma left behind a sister, a brother and her father. She was the only one that joined the church. She was the youngest in her family. Grandpa was the only one in his family also that joined the church. What a serious though it must have been to them as they contemplated the LONG, LONG JOURNEY TO AMERICA AND THE HEADQUARTERS OF THE CHURCH WHICH THEY BELONGED TOO. I wonder if any of us grandchildren can even realize what it meant to undertake the task of bringing their family to America. They sold their property in Germany and packed up the thing they could bring. They left behind their friends, loved ones, and many happy memories. It was brave family, who loved the Lord, were grateful for the Gospel Plan and for their membership in the TRUE CHURCH ON THE EARTH. Such was their faith, and it was enough to bring them through every trial, every hardship, every discouragement that came their way. They triumphed in the end and WE AS THEIR POSTERITY HAVE BEEN GREATLY BLESSED BY THEIR WISDOM, FAITH, AND ENDURANCE. They rode the train for a day and then got on a ship and went up the Rhine River. This took them three or four days. They then rode the train another day and got on a ship on the North Sea that took them to England; the sea was very turbulent and they had a rough voyage. At Liverpool they boarded a ship and was on the ocean 13 days. They stayed in New York for two days and in Chicago one day and a night. They then rode the train straight to Franklin, Idaho. They arrived on the 18th of June 1893. This was Uncle Gottlob’s birthday. It was 85 years ago tomorrow. They were met by their son George and Fred Nuffer, who was the man George was working for. They brought a buggy and wagon and took the family to Brother Nuffer’s place in Cub River. Here they stayed about a week; then purchased the farm of John Nuffer in Glendale, Idaho. It was during this week Grandpa took his daughter Mary, my mother, and they walked to the Bear Lake County seeking a farm and a home to see what was available there. They slept on the ground at nights and saved some of their bread to feed the bears so they wouldn’t bother them. They had to take off their shoes as they forged streams. It was a rough trip. From Glendale they bought a farm in Whitney and from here to Preston. In 1910 they moved to Logan, Utah to be near the Temple where they could go often. In Logan, they lived at two or three different places, but I wasn’t able to find out for sure. The places I distinctly remember was on 3rd North and two or so block East and their last home in Logan was a lovely home thy built located on 4th North and two blocks East. The first Sunday they were in Glendale, Grandpa and Grandma went to church with these five beautiful daughters and two sons. My dad, William Addison Wagstaff was the ward clerk and mother had on a red dress; dad looked down at her and winked. You see dad was well past 30 and not married. I bet he thought here is my chance. Of course there were other nice gals available, but he hadn’t married and we are happy he choose mother. Grandma soon joined the Relief Society and in the minutes of the meetings that I have, tell of her bearing her testimony often and donating eggs, wheat, calico or whatever, when ask to do so. They had a strong testimony and remained true to the Church and were ardent Temple Workers till their last days on earth. I feel these parents, children, grandchildren and great grandchildren have accomplished so much in that time 85 years tomorrow, all of the children have gone to the Temple, many have done Temple work and many of the grandchildren and great grandchildren also. Many have gone on Missions. There are Bishops, Doctors, poets, Nurses and professional people in the family. I being one of the younger ones of Grandpa and Grandma’s grandchildren, I have had the privilege of attending the funerals of some of their children and their children’s mates and many of the grandchildren and I have really been thrilled and lifted up about the wonderful things that have been said – of their good lives – their devotion to their families. I have felt so thrilled and humble to belong to such a good family and I know for a fact the wonderful words that have been spoken are true, because I have observed and could say Amen to it all. I have felt many times that if Grandpa and Grandma could see their posterity and how wonderful, faithful, devoted they ware; with a strong testimony and ardent Temple workers; they surely would be thrilled and happy. They taught their children the way they should live by example and precept and each in turn taught their children the same principles and they in turn did the same to their children. This is very commendable, I am sure. While in Germany, Grandpa worked on the roads and was a road overseer. He also worked in the Black Forest and fought in the Civil War in Germany in 1865 and the war of 1870-71. He also owned a little farm and cattle. He wasn’t a very large man about 5 foot 6 inches. He always looked well dressed, clean and very nice. Grandma was about 5 foot 3 or 4 inches and had a good shape. She always fixed her hair so beautiful, she looked nice and well dressed. I can remember this beautiful black knit winter dress she had and she always wore gloves. While in Logan Grandpa always had a lively horse, a good looking single black buggy and a real snazzy buggy whip. This one place they lived on in Logan had an extra lot where he grew hay for his horse and he’d cut it with a scythe. They also always had a nice garden and beautiful flowers. As I remember this home was on 3rd North and a few blocks East. They were hard working, thrifty people and handled their affairs very well. They really made hay while the sun shone and were able to retire at a reasonable age and had enough to live on plus an estate they left. Speaking of hard working people which they were, their children were also. I know Mother always worked in the fields, had a lovely garden – flowers and fruits and berries. Also plus making soap, butter, curing meat and those good sausages and canning besides washing on the board and knitting stockings for all of us 8 children, one pair for Sunday and one for school and everyday use. I know mother’s sisters and brothers were of the same caliber. Now I have just mentioned Mother mostly, but I guess because I knew her better, but I have observed through my life and I know for a fact that all their children, grandchildren and great grandchildren have been hard working people and early risers. At least I and my brothers and sisters and all my children know how to work, so some of it has rubbed off. I am sure life for them in Germany was hard. It wasn’t always sunshine and roses. Of course all of us knew we’d have trials and sorrows to go thru when we came to earth and I’m sure they had their share. Grandma lost her mother at age two and she was said her stepmother wasn’t very good to her. She said her father was a weaver and Grandma had to walk many miles through dark woods at night to deliver the linen to different customers. She’d carry it on her head with arms and hands to help. Often she was afraid she prayed and was never harmed. She said many times all she had to eat was a piece of brown bread and potato peeling soup, but she was thankful for that. I feel sure Grandma and Grandpa had many happy times, but they also knew sorrow. It must have been heart breaking to loose their two little boys at a tender age and have to leave them buried in Germany, when they came to America. I’m sure as most all parents are, they were grieved at times over their children’s actions. In Germany they all worked hard to help make a living. Grandma and children would do most of the farm work and care for the animals, so Grandpa could work away on roads, etc to bring a little extra means in. They would put the hay up and spend long hard days getting wood in from the forest for fuel for winter. At Christmas time and other special occasions, they could have white bread and some little cakes. They had beautiful Christmas trees decorated, Grandma really tried hard to make a sweet happy home and life for her children. Now I’d like to quickly relate a few things I can remember about them. I can remember Mother and Grandma most always conversed in German and she’d also always write letters often to her in German. She was so good at keeping up her correspondence. She’d always send love and kisses to us kids. At Christmas time they always sent a check to their children and 50 cents for each of us grandchildren. I thought I was really rich to have this half dollar to spend. The last time I saw Grandpa was in December of 1921, when he came to Ogden to Aunt Pauline’s funeral. In February 1922 he had just finished helping to pay Aunt Pauline’s funeral expenses when he took sick and died. I believe it was of Pneumonia. The last time I saw Grandma was in July 1929, when we stopped in to visit her on our way to Idaho. We took her some nice fresh strawberries from our garden. I can remember how sad and lonely she looked. She had carried on alone for almost 8 years. She was a dear and faithful to the end. She passed away in December 1929. I can remember how sad I was and what a lovely funeral they had and the nice things that were spoken of her. As a child I can remember going to Logan on the U.I.C., Railroad, or sometimes called the Galloping Goose, with Mom and Dad to visit them. It was the joy of my life. They always made you welcome and shared willingly what they had with you. It seemed we always had the same thing for supper. She would sauté a little onion in the fry pan and then add boiled potatoes cut up or sliced and browned, a piece of cheese, bread, butter and applesauce, but oh! It was good. It was such a thrill to sleep on her feather bed. I can well remember they always went to the Temple and I can see them now walking Temple hill in high gear, especially Grandpa. They always had some mints for the Grandchildren and you always got loves and kisses. I didn’t always like Grandpa’s kisses and his beard would tickle my face and his kisses were kind of wet, but I knew then and I know now also that he loved us all. What a thrill it was to go to Logan to be baptized and stay at their place and I was always so happy when they came to visit us, or we went to visit them, especially after Grandpa died and Grandma spent time with us is Ogden. They were really hospitable and in 1917 Annie our sister and Mary Wanner Andra stayed at their home while taking a course in sewing and pattern drafting at the college. Electricity at their home in Logan was cheap and they’d burn the lights most all day and night. I was really fascinated by them, as when we lived in Glendale we just had kerosene lamps, until the last two years, when we had gas lights. 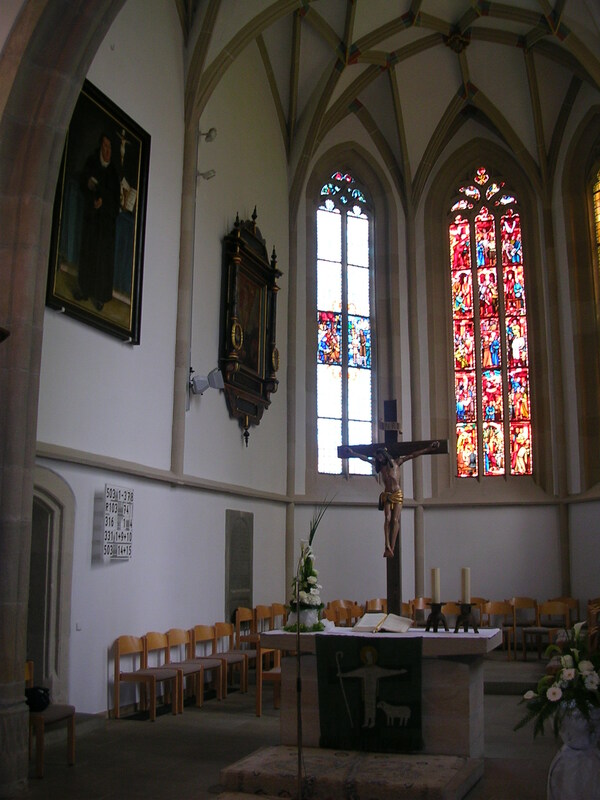 It seemed to me as a young child when Grandma would kneel beside her bed to say her night prayers, she’d sure pray a long time – always I the German language, but I now realize it was a sweet humble and sincere prayer. When I go to Logan now and to the Budge Clinic, I look across the street to their last beautiful house and well remember going there to visit them many times. There are many reasons why we should honor and love our Grandparents, but among their most wonderful accomplishments, we would have to list their diligent pursuit in genealogy and Temple Work. Both Grandma and Grandpa had a great deal of research done to find the names and vital information concerning their progenitors. Each one of us are taught to do this by the leaders of our church. Grandma and Grandpa carried on this responsibility to the best of their ability for many years. I am sure when they learned of the statement of Prophet Joseph Smith to the effect if we neglect this important work we do so at the peril of our own salvation, that it aroused in them a never ending desire to see that nothing was left undone, that was within their ability to do. After having had the research done they were able to secure the names of hundreds of their dead ancestors and spent many many hours I the Temple acting as proxy for those who never had the opportunity to hear the Gospel and take upon themselves the sacred covenants, which are necessary for exaltation in the Celestial Kingdom. I am most grateful to them for their integrity and not only teaching the highest principles of honorable dealings in their daily affairs, but for the example of following the Savior’s admonition “To love one another and to do our best to help those in need”. Dear cousins, second and third cousins, in-laws and others, our grandparents are long since gone, but I am sure their memory lives on and it could be said of them they laughed a lot and cried a little. They aren’t really dead for no man dies as long as there is one living person in the world who remembers them with fond memories and no man really dies as long as there are people on earth who really loved them. This can be said of them, many many people loved them for what they really were. They had many many friends and as I have told Horace many times, I truly loved my Grandma and Grandpa Wanner. Jakob and Salome Schmid are pleased to announce the marriage of their daughter Anna Maria to Johann, son of Johann and Anna Wanner. Johann and Anna were married 6 June 1870 in Holzgerlingen, Böblingen, Württemberg. Anna Maria Schmid was the third child of three born to the marriage of Jakob Frederick Schmid (he went by Frederick) and Salome Notter on 21 January 1849 in Holzgerlingen. Solome was 38 years old when Anna was born and died two and a half years later in Holzgerlingen. Anna’s father, Jakob, then remarried to Agnes Margarete Hasenmaier in 1852. Unfortunately, Agnes passed away a year and half later when Anna was barely over 3 years old. Jakob remained single as far as we know and raised the two girls and boy on his own afterward. Jakob was a weaver. Anna likely had few if any memory of either of her mothers. Anna was christened the same day she was born. 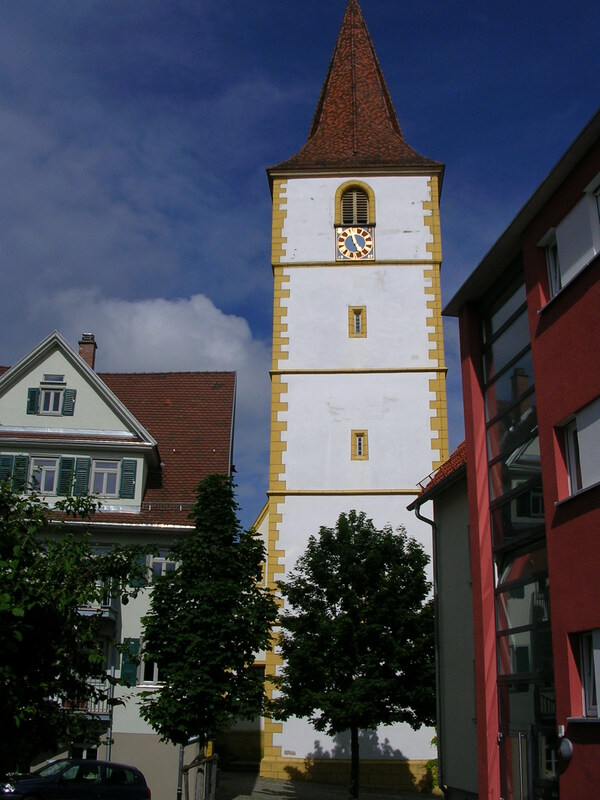 Below is a picture of St. Mauritius’ tower in Holzgerlingen where Anna was christened. This tower has been there since the eleventh century. Johann Georg Wanner was the fourth child of five born to the marriage of Johann Friedrich Wanner and Anna Maria Marquardt on 18 October 1845 also in Holzgerlingen. He was christened the next day in the same church as Anna. 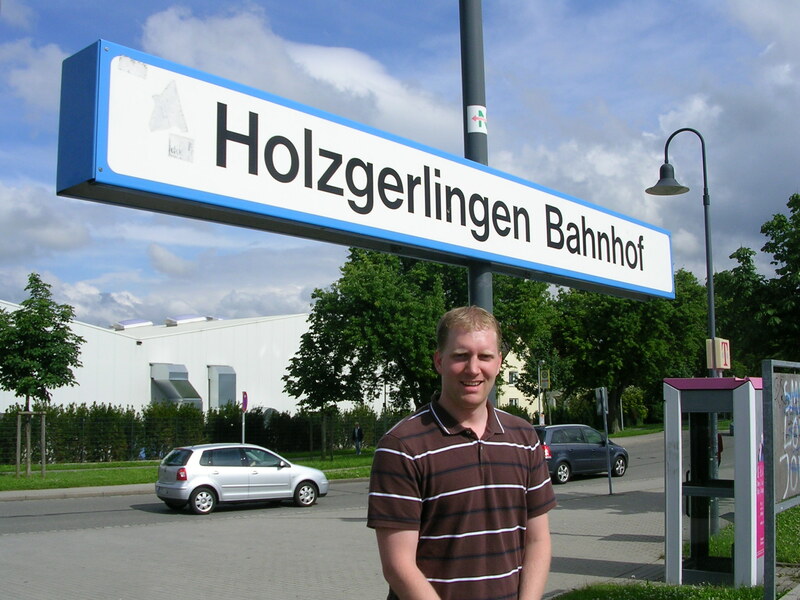 Holzgerlingen is a small town and it is very likely that Johann and Anna knew of each other growing up if not more personally. Johann and Anna were married 6 June 1870 in the same church in which they were christened. Johann and Anna welcomed a baby boy named after his father on 29 October 1870. 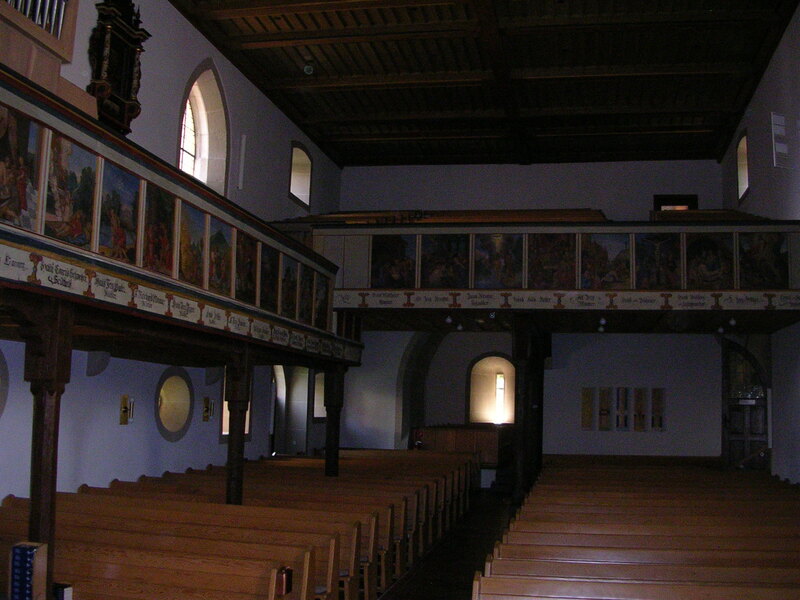 Young Johann Georg was christened the next day in the same church, likely before a congregation seated in the below nave. Johann and Anna welcomed Christina Wanner 30 March 1872 in Holzgerlingen. She was christened on 1 April 1872. Between 1872 and 1873 Johann and Anna moved to Grünkraut, Ravensburg, Württemburg. This is about 50 miles to the south. We don’t know why they moved to this tiny town. It was in Grünkraut that Maria Magdalena Wanner was born 12 September 1873. 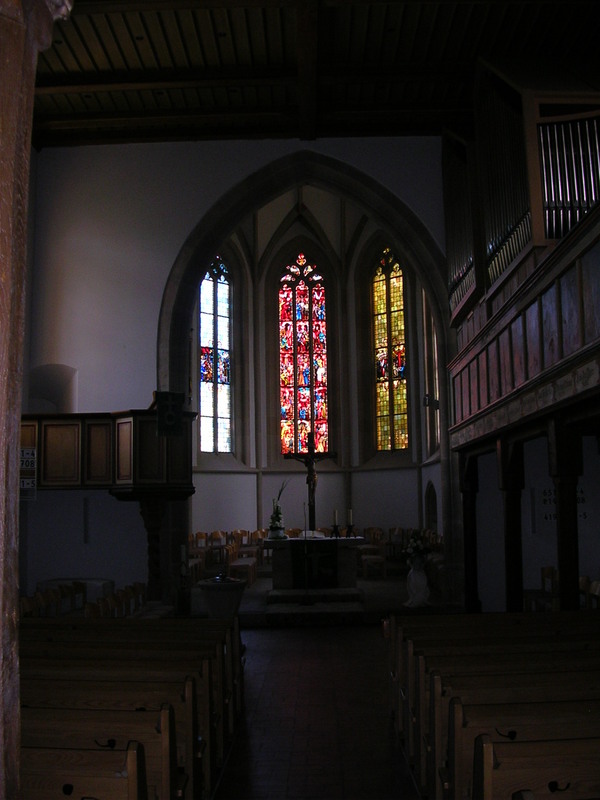 She was christened 14 September 1873 but I do not know which church the family used in Grünkraut. Johannas Wanner was born 23 June 1875 and christened the same day in Grünkraut. He died later that year on 5 November 1875. He was buried at Atzenweiler according to family records, but I cannot find this place so it must be an area nearby Grünkraut. Johannas Frederick Wanner came 28 July 1878 and was christened on 3 August 1878. He died 12 November 1878 and is also apparently buried at Atzenweiler. On 30 March 1879 Johann and Anna welcomed Luise Sophia Wanner. Christening followed 6 April 1879 in Grünkraut. Jakob Frederick Wanner appeared 14 January 1881 with christening 23 January 1881. Pauline Wanner arrived 1 April 1884 in Atzenweiler and was christened 10 April 1884 in Atzenweiler. Gottlop Wanner showed up 18 June 1886 in Kronhalden with christening 29 June 1886 in Atzenweiler. Lastly, Wilhelmina ended the caravan on 12 September 1887 in Atzenweiler and was christened 19 September 1887 in Atzenweiler. During the summer of 1890 LDS missionaries visited Grünkraut. The missionaries apparently visited with Jakob, Anna’s father. The missionary showed Jakob the Book of Mormon and Jakob took the missionaries home with him. The missionaries lived with the family for a time and the Wanner family was converted. Johann Georg Jr was the first to join the LDS Church on 11 July 1891. Johann Sr, Anna, Christina, and Maria were all baptized 16 October 1891. Jakob, Anna’s father, joined 22 February 1892. Johann Jr emigrated to America with Elder Theurer. They went to his home in Providence, Cache, Utah. We don’t know who Elder Theurer is, but he helped Johann Georg, now John George, find employment with Fred Nuffer who lived in Mapleton, Franklin, Idaho. 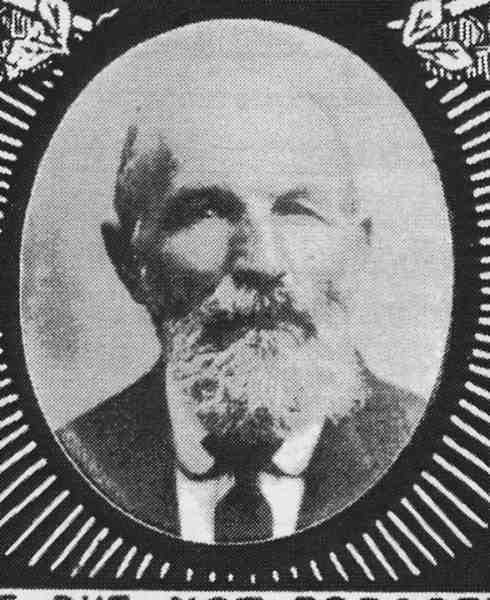 Elder John Theurer had converted the Nuffer family in Germany, so it was likely a sibling of John who helped find John Jr his employment. In 1893, the family emigrated from Germany. John, Anna, Christina, Maria, Luise, Fredrick, Pauline, Gottlop, and Wilhelmina all departed Liverpool, England on 3 June 1893 on the Arizona. They arrived on 13 June 1893 at Ellis Island in New York, New York, New York. Immediately, the family caught multiple trains through Chicago and Salt Lake with the last stop at Franklin, Franklin, Idaho near where John Jr met them with a wagon. The family arrived at Franklin on 18 June 1893 where John took them in to Preston. It was in Preston that Luise, Fred, and Pauline, were baptized 7 June 1894. Gottlob followed on 6 June 1895 with Wilhelmina 6 August 1896, all in Preston. The family immediately began to integrate with society. Christina married Charles August Nuffer 1 February 1894 in the Logan LDS Temple. John Jr married Eliza Stirland 14 November 1894 in the Logan Temple. 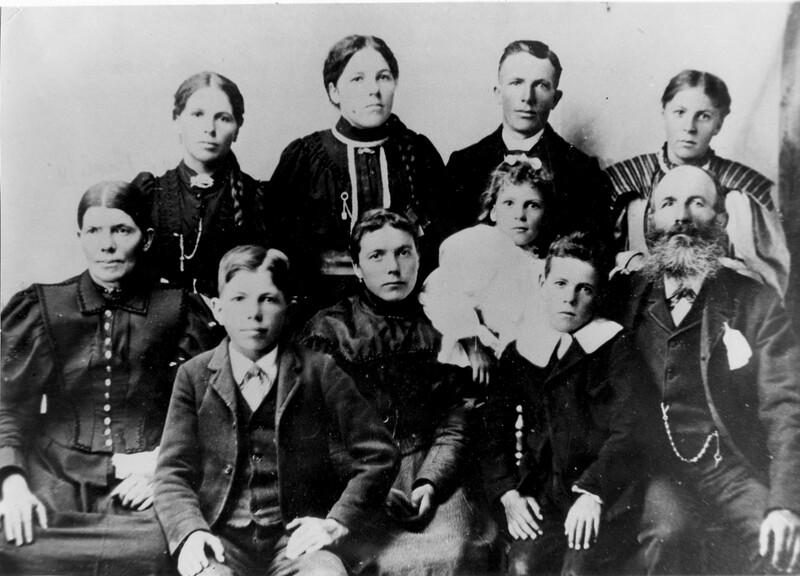 Wanner Family about 1895. Standing (l-r): Maria (Mary), Christina, Johann (John but went by George), Pauline. Sitting (l-r): Anna, Jakob (Fred), Luise (Louise), Wilhelmina, Gottlop, Johann (John). Maria, now Mary, married William Addison Wagstaff 17 June 1896 in the Logan Temple. Luise, now Louise, married Jeffery Marcelin Bodrero 16 March 1898 in the Logan Temple. John Jr remarried after divorce to Regina Frederike Nuffer 31 August 1898 in the Logan Temple. 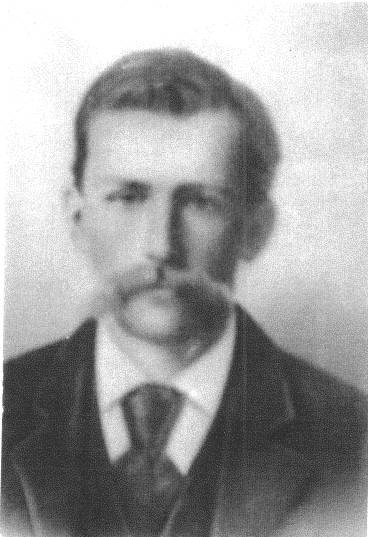 Jakob, now Fred, married Mary Elizabeth Carter 30 September 1903 in the Logan Temple. Pauline married William Henry Crossley 14 December 1904 in the Logan Temple. Wilhelmina married Moses Bodrero 18 December 1907 in the Logan Temple. Gottlop married Rebecca Hicks 16 November 1908 in Preston. 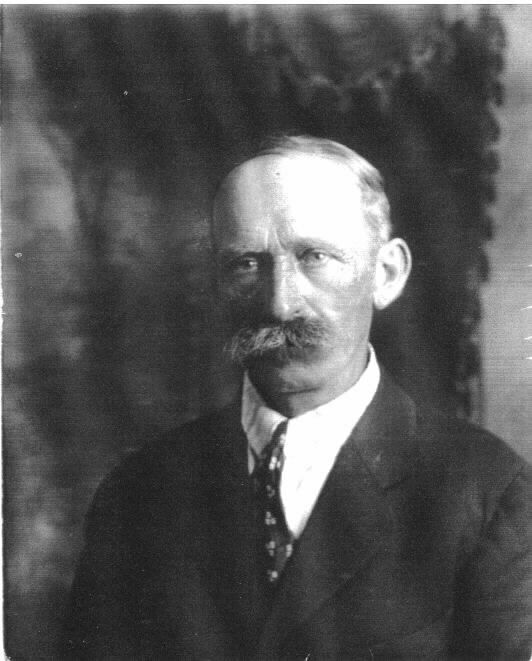 The Wanner family purchased a farm from John Nuffer, a brother to Charles and Regina, near Glendale, Franklin, Idaho. Fred purchased the farm from them around 1910. John Sr and Anna moved to Logan where they were living at 791 North 500 East when the 1910 Census was taken (the whole family was in Preston city limits for the 1900 Census). On the 1920 Census I believe they lived at 304 East 500 North, but the census is unclear exactly what street 304 is on, but going from the pattern of the census taker I believe it is the address I have listed. John died 16 February 1922 of pneumonia in Logan. Anna listed their address as 272 East 400 North in Logan. He was buried on the 19th in the Logan Cemetery. She also died of pneumonia but on 9 December 1929. She was living at the same address when she passed away. She was buried 12 December 1929 next to her husband. This is a bit of a peripheral line for me, but since a cousin made the information available, I am happy to share it here. All the credit goes to Julee Hicks for this post. Nearly everything in this post will be from the biographies and photos she forwarded. “I, Parley LeRoy Wagstaff was born April 9, 1903, in Glendale, Oneida (now Franklin) County, Idaho, to William Addison and Mary Magdalina Wanner Wagstaff. The fifth child to join this union, I was blessed May 10, 1903. “My earliest recollection was when I went to the Logan Temple to be baptized on April 18, 199 by Joseph M. Smith and confirmed April 18, 1911 by Thomas Morgan. At the age of six I started school which was in a one-room building which served as a church and school with a black stove to keep it warm. Father, being the custodial, it fell my lot and my brother Bill’s to go and build the fire in the mornings and at night we had to sweep and dust so it would be ready for school the next day. “The school house being two and a half miles away we had to walk or ride a horse. A horse fell on my leg and my Dad put a splint on it and I stayed in bed while it healed. “At the age of 12, I was ordained a Deacon, May 3, 1914 by Joseph M. Smith. I served as president for awhile. “In the summers I worked for neighbors for very little money and my board. In September 1919, we moved to West Weber; I and Bill drove a team of horses with our belongings from Idaho to West Weber. In October or November, we were quarantined with a disease and didn’t start school until the first of 1920, then we went to Wilson, I graduated on May 29, 1920. “I was ordained a priest March 1, 1925 by David Hancock. I spent my time helping on the farm in the summer and running a grain binder all over Weber County. In the winter I helped feed cattle for Lu Keller and helped Dad milk cows. “On January 17, 1928, I was ordained an Elder by Francis F. Stratford Sr.
“On March 14, 1929, I was married to Eliza Blanch in the Salt Lake Temple. We have been blessed with five children, two boys and three girls. One passed away at birth. This is all I have of Parley’s autobiography. Here is his funeral program. “Eliza Dorthea Blanch Wagstaff was born August 2, 1908 in West Weber, Weber County, Utah. She was one of nine children born to Joseph and Laura May Etherington Blanch. “Like most young girls she attended school, participated in church activities and helped her parents on the farm. “Eliza considered it a privilege to work in various homes before her marriage. She says to know people is to love them. “Her marriage to Parley L. Wagstaff took place in the Salt Lake Temple, March 14, 1929. They moved several times; the last time into the old family home where she was born and reared. They were the parents of five children, Duane LeRoy, Elelyn W. (Purdy), LaNea W. (Rawson), Brent William and an infant daughter who died at birth. “Before her marriage Eliza taught a Sunday School Class with Mary Penman for five years. For 25 years she has been an ardent worker in the Primary; starting in 1933 as a teacher. She was appointed second counselor to President Isabell Wagstaff in 1943. Two years later she was released. She held this same position twice under President Una C Greenwell; first, from March 1957 to August 1958 and from 1962 to 1964. From 1949 to 1957 she helped the 11 year old Guide boys become second class scouts and graduate from Primary before they were ordained Deacons. She was appointed by President Thomas O. Smith to work in the North Weber Stake Primary Board, February 3, 1958 and was assigned tot he Guide Patrol Department. She was released August 20, 1962. “Sister ELiza had the privilege of teaching Evelyn during her three years as Mother Bee Keeper, daughter Beehive girl. “Sister Wagstaff was appointed second counselor to President Leila C. Heslop in the Ward Relief Socity January 3, 1965. She was changed to first counselor September 12, 1965, and is currently working in this capacity. She has been a visiting teacher for several years. “Parley and Eliza were called to work on the Old Folks Committee in May 1955 and are still working on this assignment (1968). “Eliza has been a member of the Daughters of Utah Pioneers since 1947 and has held the following positions in the organizations: Captain from 1953 to 1955 and Historial from 1961 to the present time (1968). This photo was taken at a birthday party for Sarah Judkins in 1941. Back (l-r): Eve Baxter Blanch(1904-1992), Voletta Belnap Blanch(1905-2000), Lee Stoker(1910-1998), Laura Blanch Hancock(1903-1963), Wilford Newell Judkins(1881-1956). 5th Row: Alta Bailey, Albert Bailey(1919-2009), Parley Wagstaff(1903-1996). 4th Row: Nina Judkins(1924-2010), Laura Mae Blanch(1873-1942), Eliza Blanch Wagstaff(1908-1992). 3rd Row: Lynn Judkins, Ruth Hancock(1922-1998), Ethel Blanch Stoker(1910-1987), Don Blanch(1913-1997), Heber Hancock(1902-1960). 2nd Row: Newell Judkins(1917-1979), Myreta Judkins, MaryBell Judkins(1919-2000), Sarah Judkins(1899-1974), Keith Stoker(1930-1990), Val Hancock(1929-2010), Gene Hancock. Front: Bobbie Blanch, Jesse Stoker(1932-1997), Joyce Judkins, LaNae Wagstaff, Evelyn Wagstaff, Duane Wagstaff, Reed Hancock, Jerri Blanch. Eliza died 12 March 1992 in West Weber. She was buried 15 March 1992 in the West Weber Cemetery. Parley died 18 January 1996 in Bountiful, Davis, Utah. He was buried 22 January 1996 beside his wife. Back row: Bertha, Anna, Clara, Louise. Seated row: Charles, Charles, Christina. Lap children: Preston, Laura. Front: Ida, Joseph. Christina Wanner, the mother in this picture from 1910, is the sister to my Johann Georg (John George) Wanner Jr. I previously posted a family portrait for Christina’s sister, Maria Magdalena Wanner Wagstaff. At some point, I will write my Great Great Grandfather, John, but until then, I will keep writing on some of the peripheral lines. Charles August Nuffer, the father in the photo, is the brother to my Regina Friederike Nuffer. A brother a sister with the last name of Nuffer married a sister and brother with the last name of Wanner. Two other Wanner sisters married another set of brothers with the last name of Bodrero. Anyhow, the children in the above photo are all double cousins to me. Can you smell the consanguinity in the Wanner family? Charles August Nuffer was born 18 June 1871 in Neuffen, Esslingen, Baden-Württemberg to John Christoph Nuffer and Eva Katharina Greiner. His parents joined the LDS church on 12 April 1880 after following the example of their daughter, Regina who was baptized in January 1880. Charles actually joined 26 January 1894 in Mapleton, Franklin, Idaho (then Oneida County). He passed away 17 July 1952 in Preston, Franklin, Idaho and buried beside his wife 4 days later in the Preston Cemetery. If you are interested, here is his autobiography. 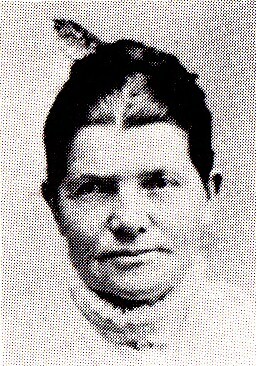 Christina Wanner was born 30 March 1872 in Holzgerlingen, Böblingen, Baden-Württemberg to Johann Georg Wanner Sr and Anna Maria Schmid. Her whole family joined the LDS church in 1891 (she 16 October 1891) and immigrated to the US in 1892 settling in Logan, Cache, Utah. She died 10 August 1940 in Preston and was buried 4 days later. Her daughter Louise, wrote a biography about her. Charles and Christina were married 1 February 1894 in the Logan LDS Temple by Marriner Wood Merrill. Note, this is 5 days after his baptism! To this marriage was born 9 children. The first 7 were born in Mapleton and the rest were in Preston. Clara Katherine Nuffer born 10 August 1895, died 18 August 1984. Married John Leroy Hansen 30 October 1918. Louise Mary Nuffer born 19 November 1896, died 16 October 1980. Married LeRoy McDonald Roberts 17 November 1944. Anna Christina Nuffer born 8 January 1899, died 25 January 1928. Married Elmer Willis Cummings 23 April 1919. Bertha Wilamena Nuffer born 9 June 1900, died 9 November 1990. Married Alfred Dean Winn 9 February 1921. Charles Fredrick Nuffer born 21 October 1901, died 30 June 1970. Married Ruth Gamble 4 October 1922. Joseph Adolph Nuffer born 18 May 1904, died 27 June 1985. Married Greta Susan Alder 20 July 1927. Ida Eva Nuffer born 15 June 1906, died 1 December 2000. Married Gilbert Warren Stater Cafferty 24 February 1926. Preston Albert Nuffer born 13 June 1908, died 20 July 1995. Married Ella May Day 24 June 1936. Laura Elvina Nuffer born 15 February 1910, died 21 December 1994. Married Hilden Jack Alvord 12 April 1929. I am happy to correct or add information to this family if you have information. 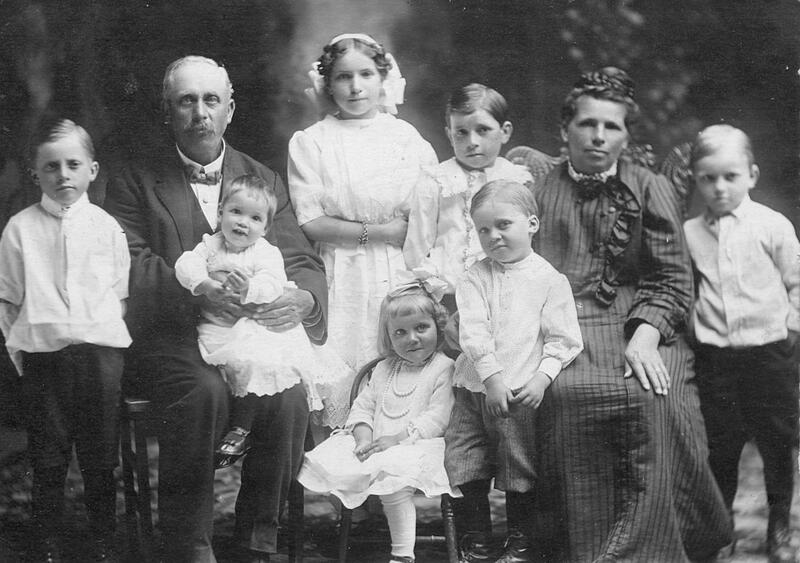 Back row: Willard, William, Annie, Parley, Maria, Jesse. Front row: Elsie, Edna, Herbert. Since this is another peripheral line, I will not get to write much on this family. But this photo I thought deserved to be shared with others. Maria Magdalena Wanner, the mother of this family in the photo, is the sister to my Johann Georg (John George) Wanner Jr.
William Addison Wagstaff was born 7 November 1860 in Kirstead, Pinxton, Derbyshire, England. He passed away 31 May 1931 in Ogden, Weber, Utah. Maria Magdalena Wanner was born 12 Sepember 1873 in Grünkraut, Tübingen, Württemberg to Johann Georg Wanner and Anna Maria Schmid. Her whole family joined the LDS church in 1891 and immigrated to the US in 1892 settling in Logan, Cache, Utah. She passed away 23 October 1952 in Ogden. William and Maria were married 17 June 1896 in the Logan LDS Temple. To this marriage were born 11 children. All of which were born in Glendale, Franklin (then Oneida County), Idaho. George William Wagstaff born 26 January 1897, died 4 February 1897. James Addison Wagstaff born 24 June 1898, died 14 March 1913. Annie Eliza Wagstaff born 27 December 1899, died 20 December 1940. I do not think she married. Wilford John Wagstaff born 28 August 1901, died 23 June 1903. 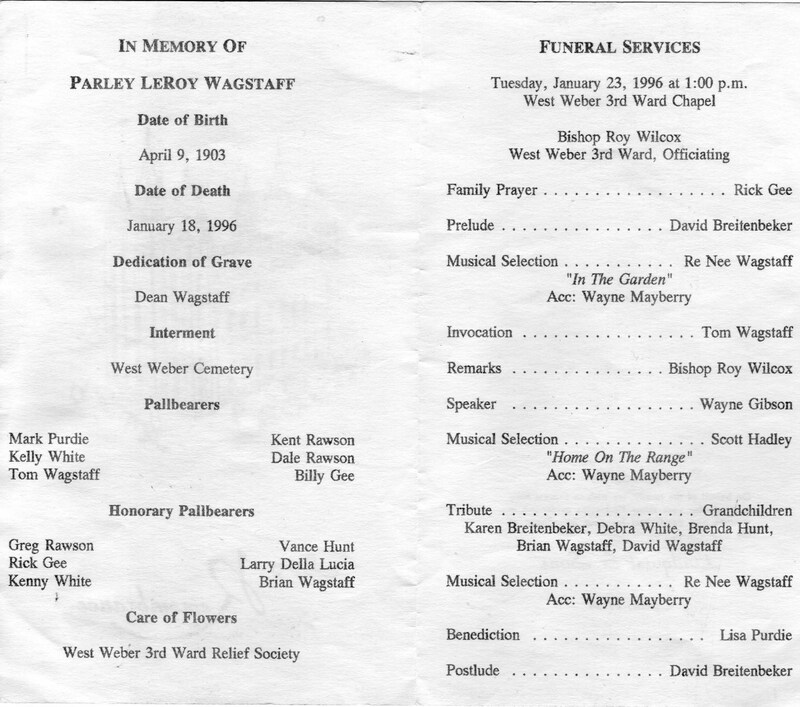 Parley Leroy Wagstaff born 9 April 1903, died 18 Jan 1996. Married Eliza Dorothea Blanch 14 March 1929. Willard Lesley Wagstaff born 3 March 1905, died 21 January 1973. Married Mary Isabell Gibson 19 October 1927. Jesse Olsen Wagstaff born 9 January 1907, died 27 October 1991. Married Berta Edna Gibby 28 October 1936. Herbert Spencer Wagstaff born 11 November 1908, died 19 March 1962. I do not believe he married. Edna Leona Wagstaff born 10 July 1910, died 11 January 1997 in Kaysville, Davis, Utah. Married Horace Raymond Owen 10 March 1933. Elsie Magdalena Wagstaff born 7 August 1912, died 4 December 1990. Married William C Coleman 17 January 1974. I do not know if she had a marriage before that. Albert Wanner Wagstaff born 8 July1915, died 19 August 1970. Married Marvel Irene Higley 2 October 1948. 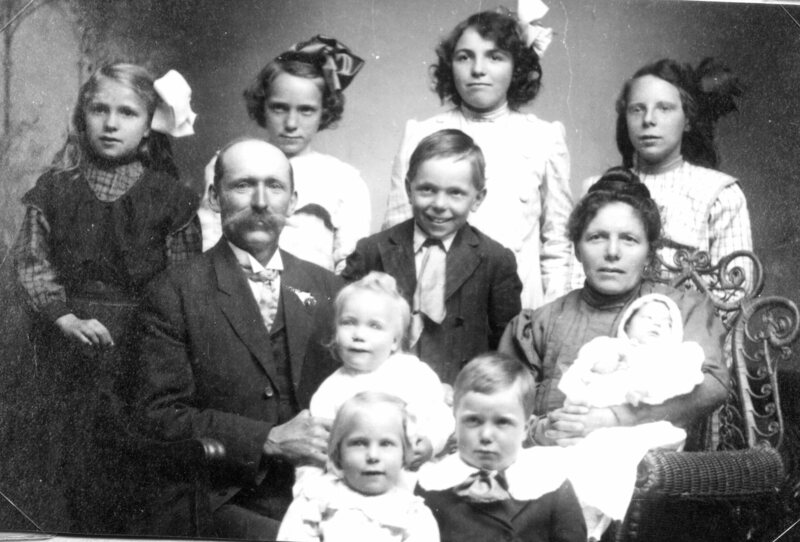 The entire family moved to West Weber, Weber, Utah after the last child and before 1920 and remained there the rest of their lives. Most of these children died in or near the Ogden area. One or two returned to the Preston, Franklin, Idaho area, probably due to relationships from before the move. 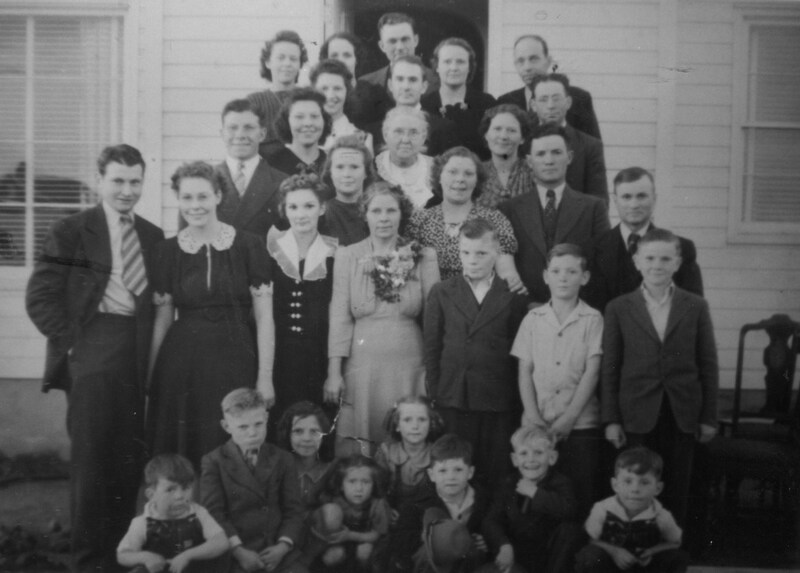 The individuals in the photograph above are as follows from left to right, front row consists of the three children in front. The photo above was taken about 1914 after James had died, but before Albert was born. Aren’t they a cute little family? If you have more information to add to this family, I would be happy to correct or add to it. Here is another update in the long goal to load all my photos up onto the blog. I have loaded my maximum for the month of May already but am happy to report I am about 90% done. Then I can spend time writing and commenting about other things rather than the latest updates in photos. My last update relating to photos dealt with the Nuffer family. My ancestor from the Nuffer family married a Wanner introducing a new name for the line. Here is the information on the Wanner family. It is a sad note that four of my great grandmother’s siblings all lived to be adults but died for a variety of reasons. Two from flu, one from blood poisoning, one as a missionary in New Zealand. Unknown Death location or life.